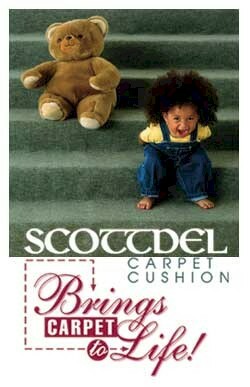 Scottdel Inc. began manufacturing bonded urethane carpet cushion in 1961 with the invention of the first patented Bonded Log Molding System, which is still used in the industry today. We manufacture a complete line of commercial and residential bonded urethane cushions ranging in density from 3.5 pounds to 10 pounds per cubic foot, suitable for installation above or below grade over any type of sub floor. Scottdel's plant and office are located in Swanton, Ohio. We deliver cushion on our own fleet of trucks in a 14 state area from Minneapolis to Baltimore. Our specialty products, MultiBond and Quiet Step, can be shipped in less than truckload quantities nationwide via RPS, a Federal Express ground service company.